This is truly a Slow Cooker marinara, as you don’t have to brown anything beforehand. So easy and flavorful, I hope I can tempt you into making your sauce at home if you’re not doing so already. If desired, turn it into a meat sauce by browning a pound of ground beef or bison together with half a pound of Italian sausage. Drain off the fat, and add it with the rest of the ingredients. For a mushroom sauce, very thinly slice two packages of mushrooms and add them to the crock. Using good quality canned tomato products makes a big difference in this sauce. Also, If you have time, rubbing the leafy spices between the palms of your hands helps release their flavors. Stir the ingredients together in a large Crockpot. Cook on low for 10 to 12 hours, stirring occasionally. Yes! I just bought a new crock pot and this would be perfect! Oh yum, I bet the flavor is very dramatic compared to store bought. I've been wanting a recipe for crock pot sauce. This sounds perfect!! Can't wait to try it! MMMMM homeade sauce, always hits the spot huh? thnx for sauce recipe.Cant wait to try it out. This looks great! I love crock pot meals. I will have to give this a try. I really need to use my crockpot more...there's nothing better than to come home from work with most of your dinner already made. This sauce sounds wonderful! This would be a great meal to come home to...a big plate of pasta with this slow cooked marinara spooned on top! Thank you for sharing an easy yet flavorful meal with me. I'm all about making my own tomato sauce. Thank you for the kind words on my blog...your thoughts are so appreciated! 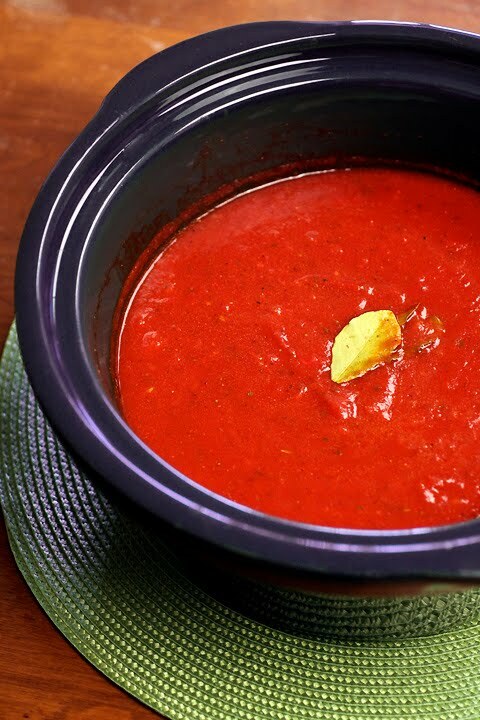 I don't use my crockpot very often but your sauce is such a great idea, especially when time is of the essence. Throw it together and let it hang out for hours while I can do tons of other things. Awesome! You can always tempt me to make my homemade sauce. I love that this is made in a crockpot, so easy! Mm I do so love a good marinara sauce but haven't attempted it myself. Wish I had a slow cooker. I love slow cooker recipes this time of year. This marinara sauce sounds like one that will become a new favorite! Beautiful homemade marinara sauce. Thanks for sharing. Summer that's awesome! Thank-you so much for letting me know you made it and it worked for you!